Fantastic views! 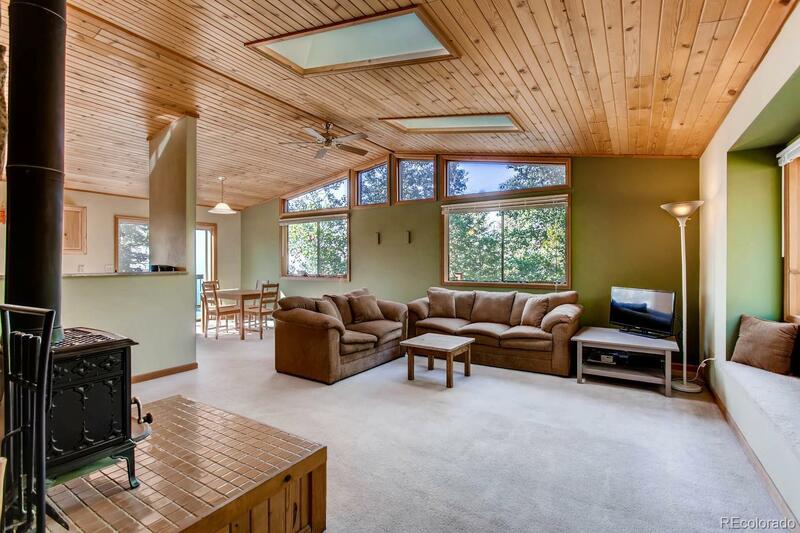 This Top of the Mountain Home boasts highly sought after main floor living, open floor plan, vaulted tongue and groove wood ceilings, skylights/walls of windows that flood the house with sunlight and a bonus mother-in-law set-up. Main level has an open updated kitchen, two bedrooms, one bath, and large living room with a wood burning stove. Lower level has a private entrance, large living room, pellet stove, extra large bedroom, kitchenette, bathroom and an office - could easily be used as a rental. One car finished garage, asphalt driveway, plus county maintained access road that is on a bus route so very well maintained/plowed. Large deck wraps around 1/2 of the house and has unbelievable views! Imagine enjoying your Morning Coffee out on your deck peacefully listening to the birds, watching the wildlife and gazing all the way to Pikes Peak! Quick and easy drive to Highway 285, just minutes to shopping and only 20 minutes to C-470.